Last Sunday on the Sunday Stealing Meme, I wrote about my favorite thing in the morning being Coffee and Chicory. I also mentioned this a few times whilst commenting on other blogs that participate in Sunday Stealing. I was rewarded with puzzled looks... well I know you can't actually look at someone on the internet but hey I have a vivid imagination and most people must have thought I had lobsters coming out of my ears. I must be a displaced Cajun at heart since it's nigh on impossible to find chicory outside of Louisiana. It all started back in the Age of Discovery when explorers brought coffee back from the New World. 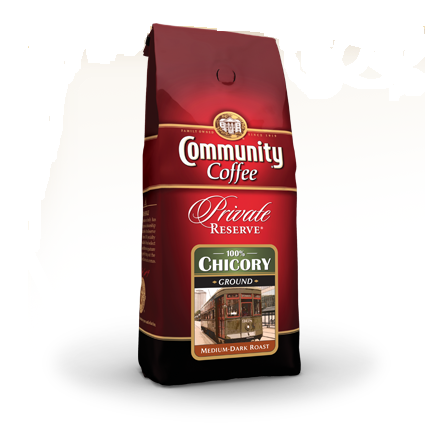 Chicory had been cultivated in Europe and North Africa since Egyptian times but it was the Dutch in the 17th century that thought it would be a great idea to mix roast chicory root with coffee. The idea was revisited again during the Napoleonic Wars when France was having a hard time importing coffee through the English blockade. 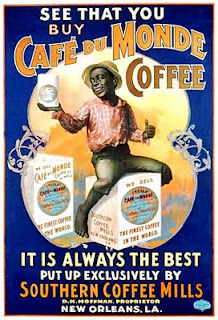 In the USA though chicory coffee is synonymous with New Orleans. They didn't drink it this way originally though, it took the Union Blockade during the Civil War to bring chicory and coffee together in Louisiana and indeed through the Southern Confederacy. Louisiana and New Orleans have continued this tradition to this day. If you ever visit New Orleans, Jackson Square boasts the ubiquitous tourist trap of Cafe du Monde, where one can get chicory coffee and beignets, French style deep fried pastries loaded down with copious amounts of powdered sugar. So how do you make chicory coffee? The shortcut style is to find a tin of Cafe du Monde or French Market brand ground coffee but this is a last resort in my opinion because you want fresh ingredients. So first thing is first, get some chicory HERE, it's $3.49/12oz bag which lasts for quite some time. While you are on the Community Coffee website ordering some chicory get yourself some dark roast coffee (Whole Beans if you grind your own or otherwise just get ground). In my opinion dark roast coffee stands up to the sweet flavor of chicory better and the chicory tames the acid in darker coffee. Try the French Roast ($6.49/12oz) or the Evangeline Blend ($9.69/12oz). Community Coffee also has a coffee club that you can join. You can set the recurring shipments to any amount of days you wish from 15-180 and all coffee club members get 10% off their order and free ground shipping on orders over $60. I have my account set up to ship every 2 months with 2 bags chicory, 4 bags french roast, 2 bags evangeline, 2 bags new orleans blend and one bag crescent city blend. Now to make the coffee. I use a typical drip coffee maker and it works fine, you can try to locate a traditional coffee biggin however they are expensive, the method is tedious and the pots you find on Ebay are rusted to hell and gone and not suitable for use anymore. So, drip coffeemaker it is, and if you're going to use one I suggest krups coffee makers, after all they made great artillery through 2 world wars... Your ratio is going to be 1:3, i.e. 1 scoop chicory to 3 scoops coffee. Mix it together slightly and brew as normal. And that's it, enjoy the smoothest tastiest cup of coffee you've ever had in your life. If you try this, please come back and comment, I want to know if I've converted you. Didn't know you could still get this coffee. Not seen it around for years, well since I was a kid that is .And thats a long time ago.My parents used to buy a bottle from the local shops . It was a liquid and they poured it in there coffee.Hope you recall that. I believe you're referring to Camp Coffee extract with Chicory and yes I do indeed remember it having spent some time over in England. Yes thats the one,I remember it now.My parents always had it .Also I remember tasting it when I was a kid.Didnt think much of it at the time. But thanks for reminding me of what it was. Time flys .